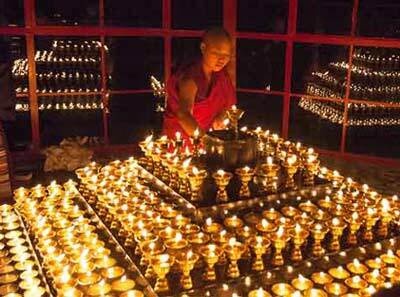 The Butter Lamp Festival, Chunga Choepa in Tibetan, falls on the 15th day of the first Tibetan month. It is the end and greatest day of the Tibet New Year celebration period. And it starts at the first day of the month. The festival is established by Tsong Khapa for the purpose of celebrating the victory of Sakyamuni Buddha over his opponents in a religious debate. In the daytime, people go to temples for worship. At night, in Barkhor Street, lots of giant butter and Tsampa sculptures, known as Torma, are displayed. They featured in different forms of auspicious symbols and figures in Buddhism and some of them tell the historic story of Buddha and his oral victory to instruct people. 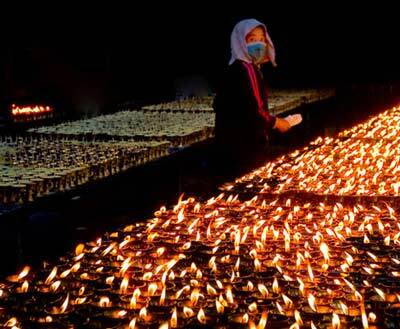 Butter lamps and some of the sculptures are lit during the night. With various colorful lights, people sing and dance happily throughout the night. Learn more Tibetan Traditional Festival.